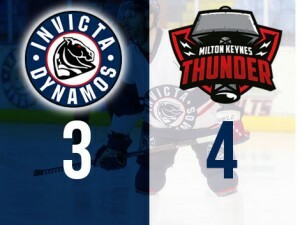 The Invicta Dynamos suffered a dose of last minute agony on Sunday night as they conceded in the final minute to fall to the Milton Keynes Thunder 4-3 despite having levelled the game from being 3-0 behind. Dynamos were missing Ondrej Zosiak and Connor Morris due to injury, Edmund Piacka due to illness and Harrison Lillis because of a four game suspension but added defenceman Ryan Giles to the team. The visitors missed Jamie Line, Oliver Lord and Tom Annetts but add Sean Norris and Sam Talbot. Opening minutes of the first period saw both teams fighting for dominance but the Dynamos took control of the play with hits on the Thunder players. Adam Long made saves from Grant McPherson and Rio Grinell-Parke whilst the MK netminder Jordan Lawday was pressured by Arran Strawson and Martin Susters. The first goal of the game came from Ross Bowers (unassisted) who shot on the Invicta net after a turnover in the neutral zone. Tom Carlon looked to score the second goal for the visitors but Long met him half way and threw himself into the puck’s path. Thunder quickly made the score 2-0 as Tomas Rubes shot the puck into the back of the Invicta net. Second period mirrored the first as both teams used physical methods to pry the puck from the other. Trevor Leblanc made the score 3-0 two minutes into the frame as the puck hit the cross bar on the attack and bounced into the net. Soon after the Dynamos were two men down as Ryan Morgan was sent to the penalty box for tripping followed by Ryan Giles for a late hit. Long lost his stick as he tried to defend from five Thunder players and the Thunder thought they had scored but the ref wiped the goal. Dynamos survived the 5 on 3 without allowing anymore goals. Lawday received a two minute delay of game penalty as he covered the puck outside the goal crease and the Dynamos took the opportunity and pinned Thunder down in their end. Anthony Leone rammed the puck past Lawday putting the hosts on the score board with the rink erupting as the team and the fans celebrated the first goal ending a 10 period drought. Two minutes later Martin Susters scored low on Lawday which closed the gap to 3-2. Dynamos were now on a roll as Callum Best was given time to shoot and tied the game at 34:19. The last period became more violent than the previous two as both teams were at each other’s ankles with slashes and hits against the boards trying to find an edge. Long was given a slashing penalty even though he took an injury in a play unseen by the officials (the Mos minutes sat by Joe Allen). Invicta managed to kill the powerplay and called for a timeout. Lawday and Long were both pressured in the remaining few minutes of the game as both teams tried to score. With 23 seconds left to play Thunder player Tomas Rubes shot the puck past Long’s shoulder to win the game 4-3. Dynamos battled hard and fast but were not able to gain any points as Milton Keynes Thunder took home the win.